Facing the Adriatic Sea, along a coastal route comprised between Giovinazzo and Terlizzi, Molfetta grew during the Roman era as attested in a document of 1217 AD, which mentioned a fishing village called Respa. This is probably a bad transcription of Melpha, which derived from the word “malf”, meaning “pit”. Its territory was however inhabited since the Neolithic era in the Pulo area, where natural pits were found along with a Necropolis. The City was also known as Melphicta. In any case, during the Byzantine era and then the Longobard, the Roman fishing village grew considerably, unifying various surrounding rural homes under an economic nudge, tied to maritime commerce, in turn linked to the birth of the Marine Republic of Venice and Amalfi and Eastern freight traffic. The Longobards followed the Byzantines and conquered a large part of Northern Puglia during the 7th Century, annexing it to the Dukedom of Benevento. The City reappeared in a document dated 925 AD, cited as Melfi and placed on the Island of Saint Andrea. In this period, Molfetta was subjected, like other coastal cities, to repeated attacks and raids by the Saracens, allocated in Sicily since ‘’827. During the 11th Century, it was the Normans who managed to conquer all of Puglia over a period of 50 years, from the Longobards and Byzantines. 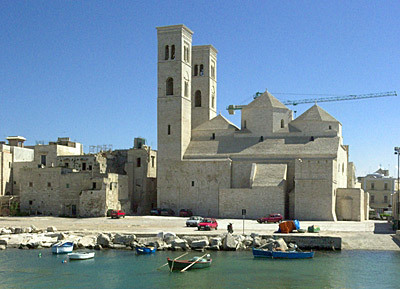 Molfetta, now a fundamental stop of commerce, became a reference point for pilgrims and crusaders heading for the Holy Land, and therefore benefiting from noteworthy administrative and commercial freedom. Corrado of Baviera, the City’s Patron, was one of these pilgrims, in that he decided to settle for good in Molfetta. ... ask to put your link here!